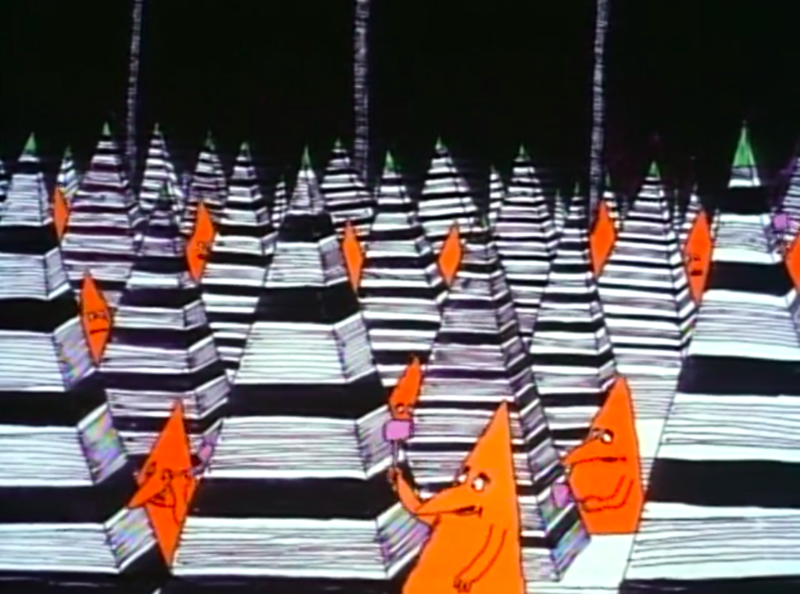 As a little girl in the 1980s, one of my favorite movies was the weird and wild animated adaptation of Harry Nilsson’s folk rock concept album The Point!. I had a well worn VHS copy that my mother had recorded off of the TV when she saw they were airing one of her favorites from the ’70s. The Point! LP was released in January of 1971, and included a stunning comic book illustrated by Gary Lund. This comic served as the template for the animated ABC Movie of the Week, which was directed by Fred Wolf and aired in February of the same year. Wolf went on to produce the films and series that undergird my experience as a child of the ’80s and ’90s, including The Mouse and his Child (1977), the Puff the Magic Dragon trilogy (1979-1983), The Fluppy Dogs (1986), and The Adventures of the American Rabbit (also 1986). The original The Point! aired with Dustin Hoffman as the narrator; however, the rights to television broadcasts being what they were at the time, his contract only authorized a single airing, for which he was paid $20,000. The subsequent home video release narration was recorded by Ringo Starr. The Point! was also produced as a stage play at London’s Mermaid Theater in 1977, starring Davy Jones (from the Monkees) as the main character, Oblio. When I was first looking for a copy of the movie as an adult (before the internet would bring you whatever you needed at the wave of a few fingers), I discovered that the version I grew up watching was not the home video release version narrated by Starr, nor was it the original broadcast version narrated by Hoffman, nor a second broadcast version narrated by someone named Alan Barzman (who doesn’t even have a Wikipedia page). It was, instead, the absolutely unobtainable-on-video version narrated by Alan Thicke, which was used on syndicated TV in the ’80s and ’90s. In my experience, this artifact of broadcast licensing creates a sense of protective defensiveness toward “the real version”—that is, the one you grew up experiencing! A folkloric ode to the outsider archetype, The Point! is also baby’s first anti-authoritarian concept album. It tells the story of a little boy named Oblio (voiced by Mike Lookinland, best known for his role as Bobby Brady) who is born with a cosmetic deformity that makes him look different from everyone else in his society. 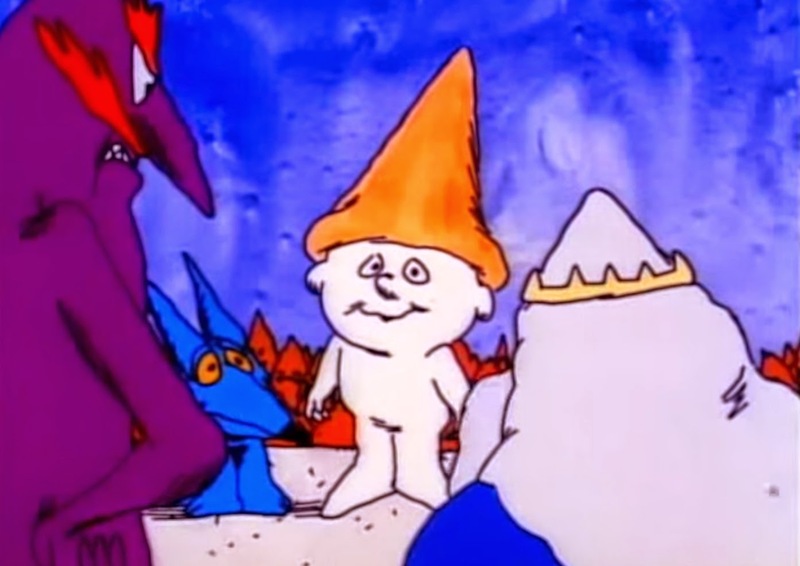 Being different is outlawed in the Land of Point, and Oblio is banished from the Pointed Village for being a round-headed boy in a land ruled by coneheads. Oblio must make his way (with his trusty dog, Arrow) through the ominous Pointless Forest, where there are many strange entities to encounter and lessons to learn. Oblio goes not on a hero’s journey but on a vagabond’s stroll that both subverts the hero’s journey while, ahem, pointedly nailing its many tropes. 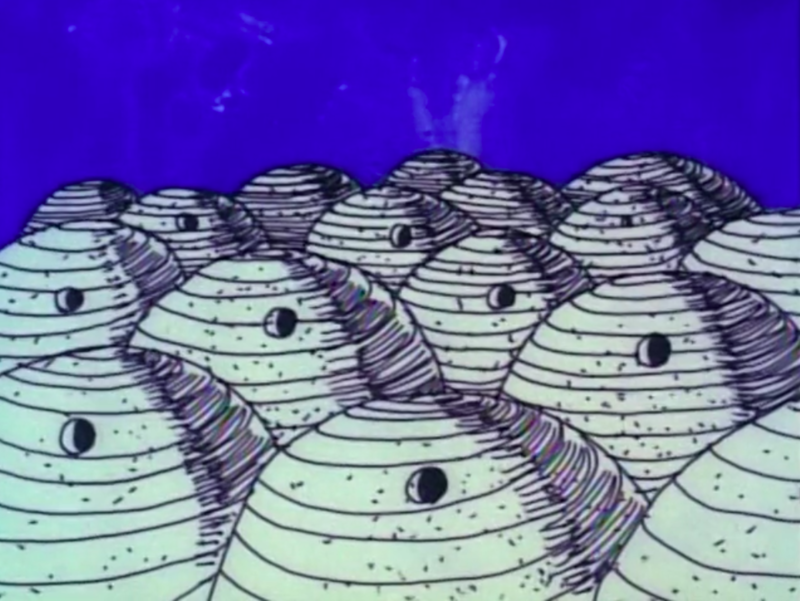 Scenes are strung together through Nilsson’s songs (which reference each other subtly throughout) and stunning, surreal, watercolor-like animation. It is a collection of mini-dissociative music videos that show Oblio’s interior life, full of visual and lyrical symbolism, adding a stunning depth to the simple parable of the pointless boy. Before I get to the point of The Point!, I’m going to dedicate some time to Harry Nilsson—quite possibly the greatest musician you’ve never heard of—and why, according to a documentary released in 2010, everyone is talkin’ about him. While deeply enmeshed with his contemporaries in the ’60s and ’70s, Nilsson’s work never catapulted to the same inter-generational fame as those he collaborated with, perhaps due to his refusal to tour or play major public venues, his notoriously difficult personality, his financial hardships, and his battles with drug and alcohol addiction. A tenor with a three-and-a-half octave range, Nilsson became known for pioneering overdub sound mixing, and for performing all the vocal tracks, lead and backing, on his own works. One critic, not in the know at the time, published a review wondering why Nilsson never credited his incredibly talented backup singers! He was also known for his creative and technical mastery as a conceptual songwriter. Nilsson collaborated with Randy Newman and helped launch his career. He also performed the theme song from The Courtship of Eddie’s Father (debuted 1969) and wrote and recorded countless songs that were used by A-list performers, television, and movies. Little Richard reportedly let Nilsson know “You sing good for a white boy!” during a demo. Nilsson worked hard and played hard. “Mama” Cass and Keith Moon died four years apart in his London flat, a popular crash spot for touring musicians visiting London in the ’70s (Nilsson was not on site for either incident). Most notably, Nilsson was very close with The Beatles, living with both Ringo Starr and John Lennon at different points in his career. The Beatles declared Nilsson their favorite American musician, and unanimously agreed that Nilsson’s cover of “Mother Nature’s Son” was their favorite version. BBC documentary series Imagine even had an episode dedicated to Nilsson, titled “The Missing Beatle.” (Tying together Nilsson’s wild friendships with both the Who and the Beatles is the incident where John Lennon wrote to Phil Spector accusing Nilsson and Moon of urinating on some damaged recording equipment.) 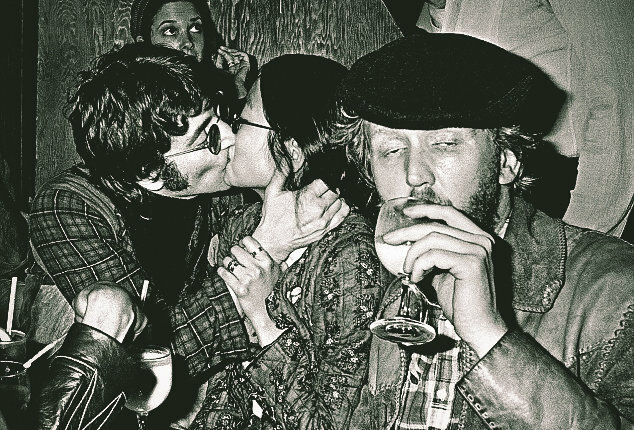 After John Lennon’s murder in 1980, Nilsson was so profoundly affected that he gave up his reclusive lifestyle to become an outspoken and public gun control advocate. In 1990, Nilsson discovered that his financial manager had embezzled all his money earned over his career, leaving him with only $300 in the bank. This scandal left Nilsson’s final years plagued by debt, loneliness, and disease. Nilsson died in 1995 after surviving a massive heart attack, living just long enough to record the vocal tracks for a final legacy album, which was never released for unknown reasons. 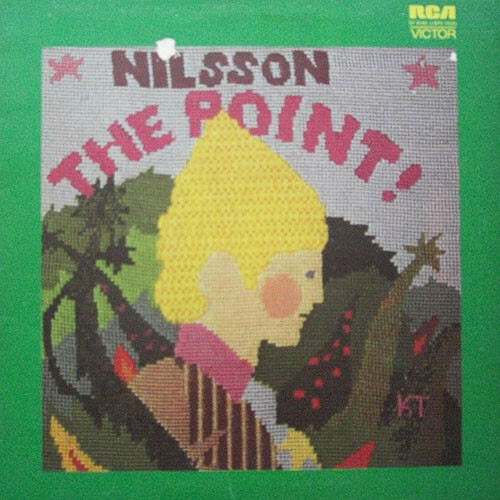 And in the midst of a lifetime of tribulation, from 1970 to the beginning of 1971, Nilsson wrote and recorded his folk-rock masterpiece: The Point!. The film adaptation is one of the rare cartoons from my youth that holds up, infinitely, to rewatching; it is the film I use to help people I’m close to understand me better. I struggled a bit when trying to decide how to write about this brilliant little cartoon. There’s a sharpness to its cultural commentary that would lend itself to detailed scene-by-scene analysis, but given its 75-minute run-time, it would take me dozens of pages to get through the rich and lush tapestry of words, images, and music. Instead, I’ve tried to draw out the most significant and subtle ways that Oblio and his lessons have stuck with me in the 30 or so years since my first viewing, while still trying to keep narrative clarity for the uninitiated reader. I believe The Point! still has much to teach us. 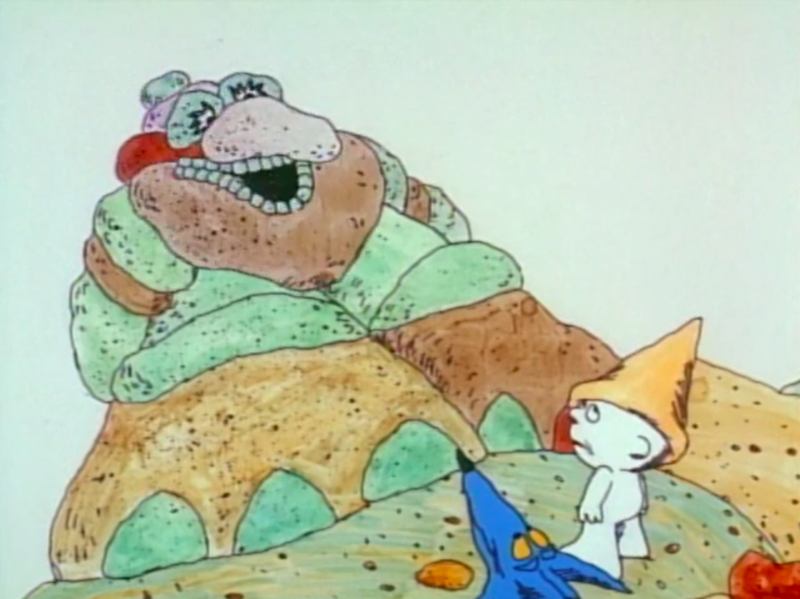 Using story-within-a-story framing, the cartoon opens on a debate between a little boy (also voiced by Lookinland) and his father (Hoffman/Starr/Thicke). The older generation and the younger generation are squabbling over the difference between old media and new media. The father prefers written stories, the boy wants to watch his favorite TV program, but it turns out the story the father wants to read and the one the boy wants to watch are one and the same. The implication here is not to fear the incursion of new media as a way for stories to reach out and connect deeply and through multiple sensory portals with new audiences. We are introduced to the Land of Point through a series of vignettes set to the song “Everything’s Got ‘Em” which illustrates the rigidity of the institutions found there. Even art and philosophy have stagnated into performances of pointedness where non-pointed variations or innovations are rejected, and repetition of the familiar point is lauded. This society is driven by a pointed cultural hegemony. We meet our protagonist Oblio as an infant. News of his deformity (or shall we say his nonconformity) spreads through the town via the rumor mill. Healthy, happy, and oblivious, Oblio wears the pointed cap his mother made to “make him look a lot more like the ordinary kids in the village.” This is all reminiscent of Rankin-Bass’s 1964 Rudolph the Red-Nosed Reindeeer: Oblio will also leave his home with a shorter sidekick, have many daring adventures, and encounter his own version of “misfit toys.” What is significant is the way these two stories diverge in their morals, which we will revisit toward the end. Oblio’s shorter sidekick is his dog, Arrow. “Me and My Arrow” was the breakaway single from The Point! and reached #34 on the Billboard hot 100; it was one of three songs from The Point! performed on tour by Diana Ross in 1977 and recorded for her live album, An Evening with Diana Ross (1977). 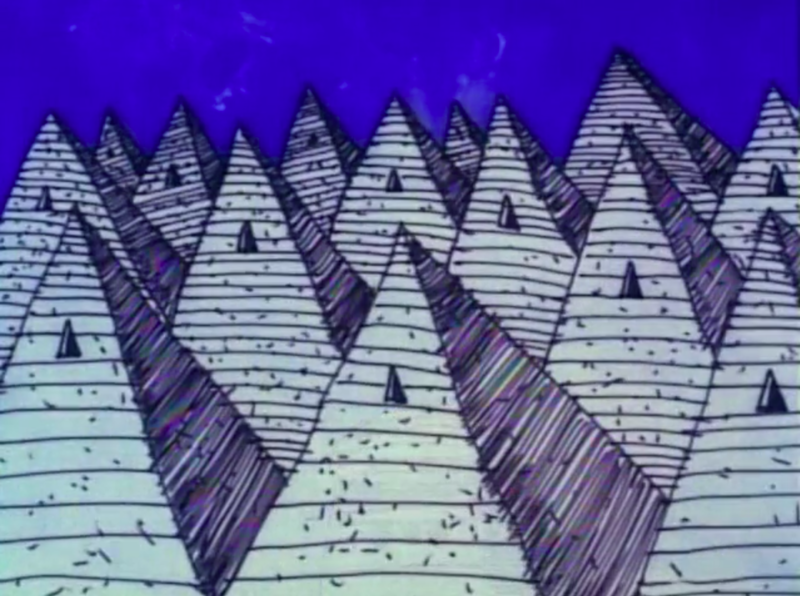 Oblio’s round head threatens the triangular supremacy of the Land of Point, although he is able to get along just fine as long as he doesn’t call attention to himself. He and Arrow make the deadly mistake of being better at sports than a spoiled child of the ruling elite, however, and Oblio finds himself being prosecuted for his round-headedness. The prosecutor, the Count, is the quintessential embodiment of the establishment that the counterculture of the late ’60s and early ’70s resisted—and which we’re still dealing with today. He doesn’t speak; he bloviates. He not only creates and engages, but revels in the spectacle of his own power. He thrives on the enforcement of hegemony and inflames the worst of people’s biases. He mounts a court case against Oblio’s round-headedness as a social and physical perversion, and leverages the letter of the law and appeals to tradition against him. The Count as prosecutor uses law and rhetoric to force the good-natured but largely passive king to banish little Oblio (and his accomplice Arrow) from the Land of Point to the Pointless Forest. He beats the drum of conservatism and fear and extracts compliance from those who might have been inclined to make more compassionate and reasonable decisions—and renders Oblio legally pointless. The repetition of phrases like “The law is the law” and “He’s just doing his job” are used by the people to excuse the banishment of an innocent young boy whose only crime was being born different. Even without a fundamental thesis of wrongness associated with roundness, the people ascribe rightness to pointedness, and are willing to tolerate violence against anything othered, or different, because of it. Even though the majority of people believe what is happening to Oblio is wrong, they feel powerless to do anything about it. This social structure in the Land of Point is, incidentally, a patriarchy: a triangular hierarchy in which fathers and even kings are impotent to protect Oblio when faced with the letter of the law, and in which law runs contrary to the thread of justice. One of my favorite things about the movie is its refusal to sanitize major existential themes for a young audience. After parading around the incompetence of the law and the authorities embedded within it, we’re treated to my favorite song in the whole movie, the surreal and ecological “Think About Your Troubles,” which bridges the journey from the Land of Point to the Pointless Forest. This song, covered by the band Belly in 1995, is a contemplative and cyclic meditation on sorrow, life and death, and the profound, inescapable normalcy of these processions and experiences. The Pointless Forest is not what Oblio expected. First, he notices the trees are clearly as pointed as any he saw in the Pointed Village. Then, the first person Oblio meets in exile is the three-headed, fast-talking, arrow-covered Pointed Man. The Pointed Man fills many roles. He is meant to position himself as the mentor in the hero’s journey, but then proves himself to be the most pointless of all the beings Oblio encounters. The Pointed Man is a false prophet. His opinions and positions are thoughtless and rushed, his values are ostensibly “modern” and “Western,” but his judgments of others are harsh and petty, and he is fickle and unreliable. Straightaway, Oblio begins to realize his banishment is not going to go the way he had imagined, and that, in fact, what he believed to be true about the world might turn out to be false. He begins to cultivate a sophisticated meta-awareness, considering for the first time that the symbol might not actually be the same as the thing it represents. This becomes the central guiding question of Oblio’s quest. What is a point? What does it mean to have a point? What is pointlessness, and who gets to make that decision? In his journey through the Pointless Forest, Oblio encounters wild bees, a wise and mellow rock man (a hippy stoner who quips, “Hey, man, you don’t have to have a point, to have a point”), and a tree man who is in leaf design, sales, and distribution. He encounters a bottomless pit and the vanishing point, and three round, fat, joyful, dancing ladies. Everything and everyone he meets refuses to fit inside a box, a binary, an easy label. The very idea of pointedness and pointlessness begins to dissolve as Oblio looks at it with intention. Oblio finally goes to sleep, with the final musical number of the movie, “Are You Sleeping.” When he wakes, he finds himself on the other side of the Pointless Forest, pointed in the direction of the Pointed Village, labeled “destination point.” Oblio is a changed boy. With his new understanding, he returns to the Pointed Village. Although he has been gone a very short time, the denizens of the Land of Point are overjoyed to see him. None of them felt good about the rules that sent him away in the first place, and his return has galvanized them to stand up to the law itself. This is where Oblio’s story diverges from Rudolph’s. Rudolph learns to make his nonconformity useful, to become acceptable to and be swallowed up by existing social roles and responsibilities, blending back in to the society that had rejected him by proving himself. Oblio has no useful trick for the people, and he never needs to prove anything to anyone in order to return. He must merely exist, and that’s enough to turn the people against the structures that had alienated and banished him. As Oblio’s return levels the people’s belief in a blind adherence to nonsensical laws and the triangle’s cultural hegemony, it also levels the physical manifestation of that hegemony. 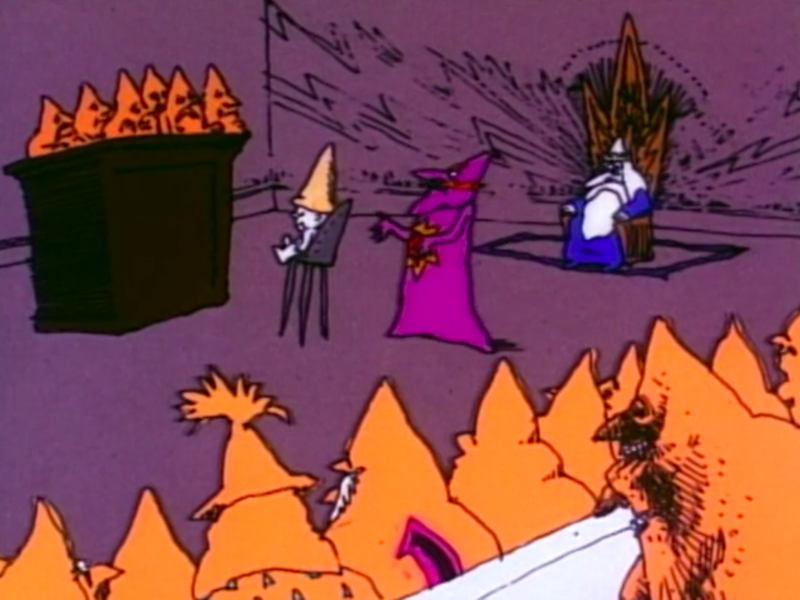 The count demands to see Oblio’s point, knocking the cap off of Oblio’s head—and, to everyone’s surprise, he does have a point, right underneath his hat! But right then and there everything starts to change. Buildings collapse into domes and people’s beloved points recede into their skulls, and the count and his son run away in shame while Oblio is embraced by the crowd. The central theme explored throughout The Point! warns the viewers of the dangers presented by a society that has confused the symbol of a thing for the thing itself. The film shows us that this confusion is part of why a society does not have the capacity to respond when confronted with someone’s startling uniqueness. This filters down into a rule of law that is divorced from the will of the people—passive, incompetent, or corrupt—and becomes the self-reinforcing structural hegemony that governs the Land of Point and dominates the mental infrastructure of its people. In the Land of Point, triangles are mistaken for the metaphysical point of a thing. In other lands, it might be mistaking the trappings of freedom for freedom itself, or conflating access to material goods with prosperity, or individualist rhetoric with authentic respect for the unique expression of each individual. The natural world, the Pointless Forest, breaks apart these assumptions and expectations, offers new modalities, and educates Oblio in a more authentic, less confused way of being. Oblio, in his role as the outsider, was the only one positioned to disrupt the polite authoritarian rule of the Land of Point. The point of The Point! is clear: when the “wisdom” of society fails, it is the wisdom of the outsiders who can make us whole, teach us to embrace our true selves, and ultimately usher in the transformation necessary for a more free and just society. And that is why I love, will always remember, and recommend that you watch The Point!. Mandy Leetch is an educator, researcher, and writer focusing on consciousness development, ecopsychology, and new materialism. She lives in the Blackstone River Valley of the Berkshire Mountains bioregion on the ancestral lands of the Nipmuc peoples. She believes that ethical dedication to our human and more-than-human communities across complex and emergent scales will liberate our shared regenerative potential. Wonderful piece. Nilsson contributed to music in variety of ways during his career, and “The Point!” Is as meaningful today as it was when it was first produced. Nilsson died in 1994, not 1995 as stated in the article.